6. 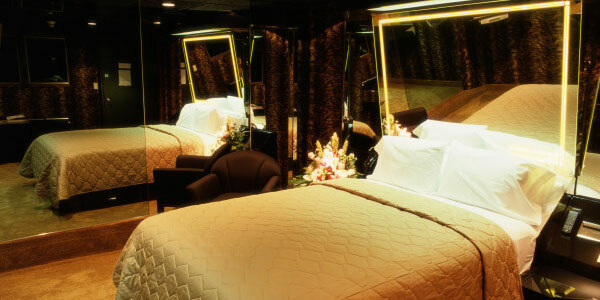 The Hollywood Motor Inn, East Farmingdale, New York Nothing says lovin' like ceiling mirrors, mood lights, black vinyl padded walls, and a stripper pole on a stage. Well, maybe not so much. But at the Hollywood Motor Inn's Exotic Dancer Room, you can have all that and more, if it just so happens to be your cup of tea. Now all you need are the exotic dancer lessons to go with it. THEY HAVE A STRIPPER POLE IN ONE OF THEIR ROOMS! Spectacular theme rooms! Try the jacuzzis they're great! Amazing rates! Discreet in every way! Private parking! Friendly employees! Great location! If your doing wrong... Can't go wrong here! A private discreet adult themed motel getaway. Convenient Farmingdale Airport location bordering the Southern state parkway. Jacuzzi, Arabian, Jungle, Stripper Pole rooms available. Free adult movies on 3 chanels. Free coffee and Dunkin Donuts in lobby.